How do you let the one you love know how you feel when they’re around? 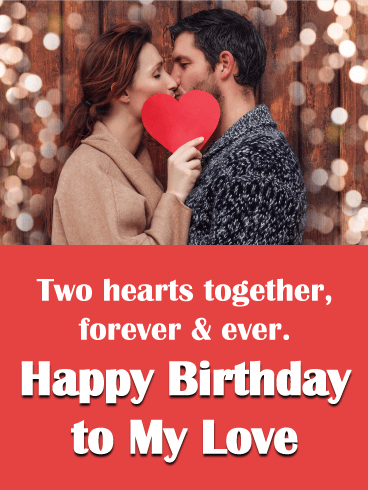 With this romantic card to help celebrate their birthday. A single heart is being held in someone’shand as the sun sets from behind. And the touching words express how much they mean to you, today and always. 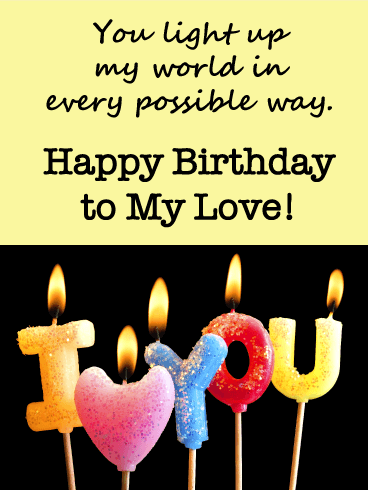 For the one who lights up your world in every possible way, this heartfelt card is sure to make their birthday! Brightly lit candles that spell out “I <3 You” are set against a black background, and above is a special greeting to that special someone who you can’t live without. What a wonderful way to make this year’s celebration one they’ll always remember. 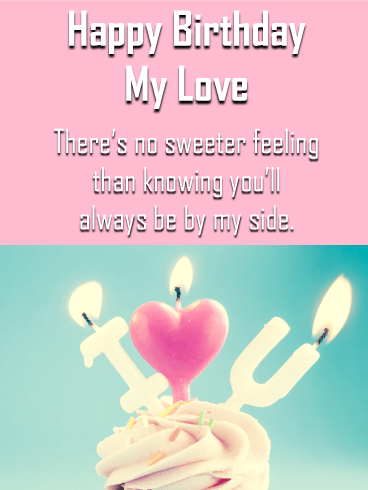 When your sweetheart’s birthday comes around, capture such an important occasion with a special card to show you care. A cupcake with layers of frosting is topped with candles that read: “I <3 U”, all burning brightly, much like your love burns for them. Above are your sentimental words, reminding them how much it means to you to know they’ll always be by your side. 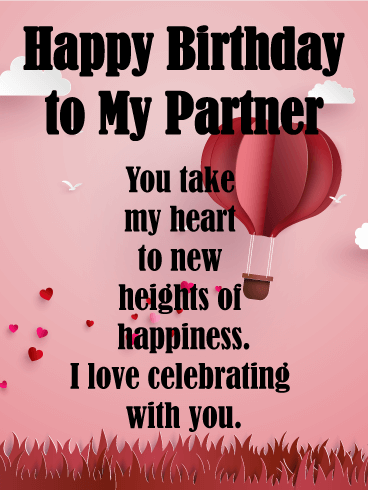 If you have the kind of partner who sends your heart soaring, let them know with this romantic birthday card. A heart-shaped hot air balloon will take their feelings to new heights as you celebrate another year together. What a wonderful expression of your deepest feelings on such a special day. They complete you in every way. They’re the one you want to share every day with. 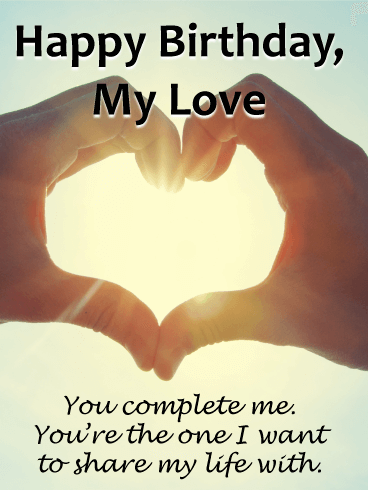 Let the love of your life know your deepest feelings on their birthday with this romantic card. Two hands are locked together in a heart to symbolize the unbreakable bond the two of you share. And what better time to celebrate that special relationship than on such an important occasion. 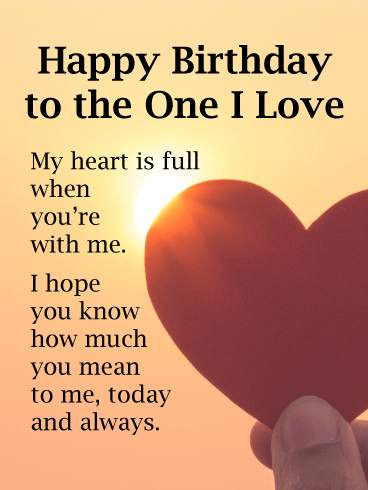 Simple but sentimental, this birthday card for the one you love captures all the feelings you have in your heart, now and forever. A couple shares a kiss behind a red heart, with warm golden lights in the background. What a beautiful expression of how much they mean to you on a day that’s extra special like this one. They’re your partner in life and in love. What better time to let them know then on their birthday. This romantic card shows a couple cuddling together as the sun sets in front of them. 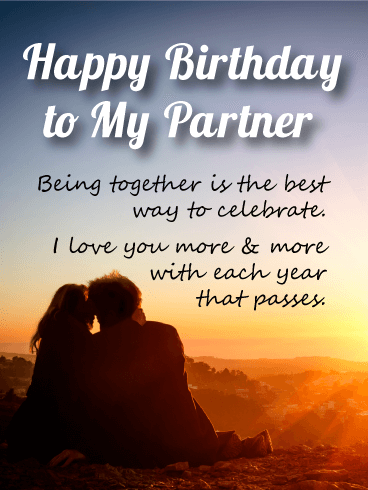 It’s a reminder to that special someone that all you need to celebrate is the two of you, and that your love for them only grows with each passing year. 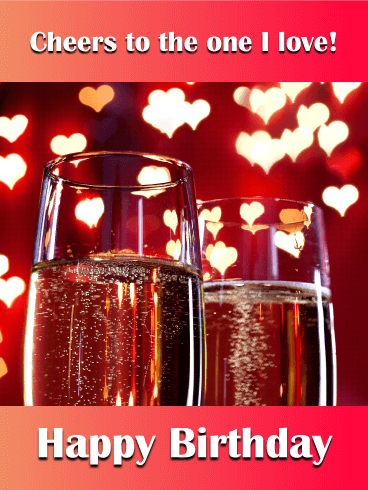 Two glasses of bubbly sit waiting to toast the one you love on their birthday. In the background are warm, golden lights, setting the scene for a romantic celebration for two. And while the message may be simple, it gets to the heart of how you’re feeling inside and a makes a wonderful expression of how much they mean to you. They warm your heart like no one else and still know how to make you blush. 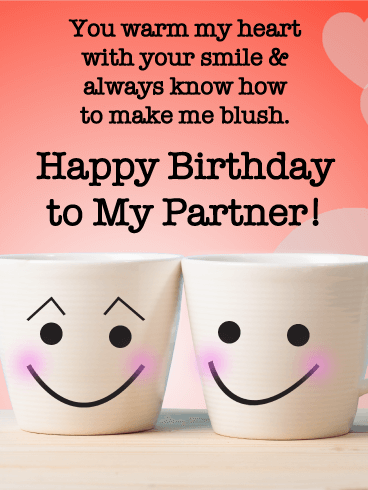 So when the time comes to celebrate your partner’s birthday, this sweet card is a perfect choice. Two happy face cups with rosy pink cheeks are sure to make them smile. And the words will leave them feeling special as they celebrate this day with the person who completes them. 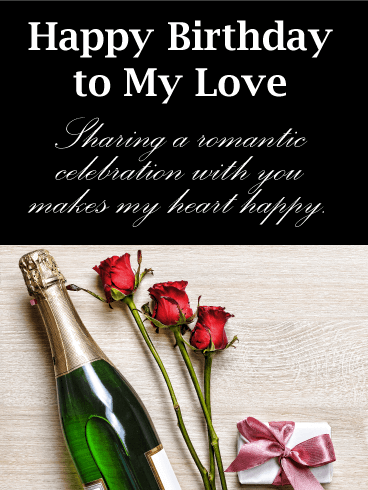 This romantic card for the one you love has all the elements of an unforgettable birthday: a bottle of wine, long stem roses and a beautifully wrapped gift. What better way to let your partner know what’s in store as you celebrate together. After all, sharing such a special moment with them makes your heart so very happy.